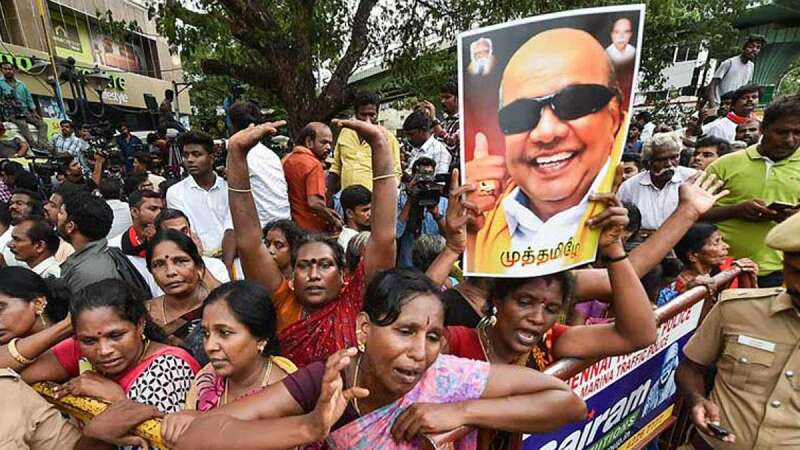 Chennai : The Madras High Court on Wednesday morning would decide on the DMK's plea against Tamil Nadu's government's decision to deny burial of the party President M. Karunanidhi's body at Marina Beach. Hearing the plea late Tuesday night, the court directed the state government and the Chennai Corporation to file their replies and adjourned the case to Wednesday morning 8 a.m.
At the hearing the state government had opposed the allotment of space at Marina Beach for burial of Karunanidhi's body. On Tuesday, the DMK party and family members of Karunanidhi had requested the state government for allotment of space near DMK founder C.N. Annadurai's memorial at the Marina Beach. On Tuesday, the government decision drew flak from leaders cutting across party lines including Congress President Rahul Gandhi, MDMK's Vaiko, DMDK's Vijayakanth and PMK's S. Ramadoss, who favoured a memorial on the Marina Beach. Congress leader Ghulam Nabi Azad and the CPI(M) also joined the chorus. Ramadoss said even when AIADMK leader J. Jayalalithaa was buried at the Marina Beach there were court cases pending. Her body was buried at the Marina Beach within the memorial of AIADMK founder M.G. Ramachandran. The mortal remains of AIADMK founder M.G. Ramachandran and his successor Jayalalithaa are buried near Annadurai's memorial on the Marina Beach.